The drug can be used for acute myocardial infarction after ventricular premature beats and ventricular tachycardia, and for digitalis poisoning, cardiac surgery and ventricular arrhythmias caused by cardiac catheterization. But it is usually ineffective for supraventricular arrhythmias. Anesthetic (local); antiarrhythmic (class IB). Long-acting, membrane stabilizing agent against ventricular arrhythmia. Originally developed as a local anesthetic. The incidence of adverse effect with lidocaine hydrochloride was about 6.3%. Most adverse effects are dose dependent. Adverse effects are drowsiness, dizziness, nausea, vomiting, burnout, euphoria, insanity, muscle convulsions, syncope, blurred vision, confusion and difficulty breathing. Large doses lead to severe sinus bradycardia, cardiac arrest, severe atrioventricular block and weakened myocardial contractility, reduced blood pressure and so on. Excess concentrations of lidocaine hydrochloride in the blood cause some problems. For example, atrial conduction slows, atrioventricular blocks (A-V-B), and inhibits myocardial contractility and cardiac output decreases. There are little allergic effects, such as erythema rash, angioneurotic edema and so on. ChEBI: The anhydrous form of the hydrochloride salt of lidocaine. Surface anesthesia with solution of 2% to 5%.Infiltration anesthesia with solution of 0.25% to 0.5%, conduction anesthesia with 2%, each injection point, horse, cattle 8 to 12 ml, sheep 3 to 4 ml. Epidural anesthesia with 2% solution, horse, cow, 8 to 12 ml, dog, cat, 0.22 ml per kilogram of body weight. Subcutaneous injection with 2% solution, pig, sheep, 80 ml, horse, cow, 400 ml, dog,25 ml, cat, 8.5 ml. Treatment of arrhythmia, intravenous injection: Per kg of dog’s body weight of the initial dose is 2 to 4 mg, followed by 25 to 75 micrograms per minute intravenous infusion; Cat initial dose of 250 to 500 micrograms, followed by intravenous infusion of 20 micrograms per minute. Lidocaine hydrochloride is a local anesthetic and antiarrhythmic drug. It is clinically used for infiltration anesthesia, epidural anesthesia, surface anesthesia (including in the thoracoscopy or abdominal surgery for mucosal anesthesia) and nerve conduction block. The drug can also be used for acute myocardial infarction after ventricular premature beats and ventricular tachycardia, and for digitalis poisoning, cardiac surgery and ventricular arrhythmias caused by cardiac catheterization. But it is usually ineffective for supraventricular arrhythmias. 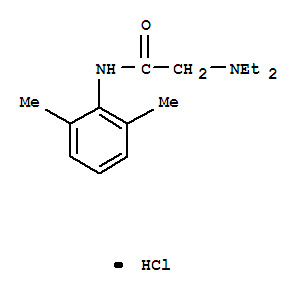 Lidocaine hydrochloride is an amide local anesthetic. After blood absorption or intravenous administration, the drug has obvious excitement and inhibition of biphasic effects for the central nervous system, and no excitement of the pioneer. With the dose increased, the role or toxicity increased, there is an anti-convulsive effect with sub-poisoning plasma concentration; Blood concentration of more than 5μg • ml-1 can occur convulsions. Lidocaine hydrochloride in low doses can promote outflow of K+ in cardiomyocytes, reduce myocardial autonomy, and has antiarrhythmic effects. In the treatment dose, lidocaine hydrochloride has no significant effect for the electrical activity of cardiomyocytes, atrioventricular conduction and myocardial contraction. Increased plasma concentration may cause slowing of heart conduction, atrioventricular block, inhibition of myocardial contractility and decreased cardiac output. Alpha caine Hydrochloride (Carlisle); Anestacon (Polymedica); Laryng-O-Jet (International Medication); Lidocaton (Phar maton); Lidopen (Meridian); Xylocaine (Abraxis); Xylo caine (AstraZeneca); Xylocaine (Dentsply). Cimetidine and β-blockers can inhibit metabolism of lidocaine through liver, so that the blood concentration increases and adverse reactions occur in the heart and nervous system. We should adjust the dose of lidocaine hydrochloride. Barbiturates can promote the metabolism of lidocaine hydrochloride, and the two drugs can cause bradycardia and sinus arrest. Combined with procainamide, the drug can produce excessive delirium and hallucinations, but does not affect the product plasma concentration. Isoprenaline Isoprinosine could increase the total clearance of lidocaine hydrochloride through increased liver blood flow; norepinephrine could reduce the total clearance of lidocaine hydrochlor through reduced liver blood flow. The drug is contraindicated with phenobarbital, thiopental sodium, sodium nitroprusside, mannitol, amphotericin B, ampicillin, and sulfadiazine. Lidocaine hydrochloride is characterized by strong penetration, strong dispersion, rapidly onset. The anesthetic performance is twice that of procaine and the toxicity is1. There is an anesthetic effect after 5 minutes treatments, and anesthesia can last 1 to 1.5 hours, 50% longer than procaine. The drug is effective on the heart of the disease or arrhythmia caused by cardiac glycoside, but on the supraventricular tachycardia is poor. This product is fast and oral ineffective, with short duration, and often used as intravenous administration. Lidocaine hydrochloride is white and odorless crystal with bitter and numb taste. It is easily soluble in water, ethanol and organic solvents, but insoluble in ether. Aqueous solution in the case of acid and alkali do not break down, repeated autoclave rarely go bad. Patients Allergic to other local anesthetics may be allergic to lidocaine hydrochloride. The following circumstances with caution: Pregnancy, neonatal especially in premature infants, liver blood flow reduction, liver and kidney dysfunction, congestive heart failure, severe myocardial damage, low blood volume, shock and other patients. Strictly grasp the concentration and total medication, excessive can cause convulsions and cardiac arrest; the body metabolism is slower than procaine, and there is accumulation, causing poisoning and convulsions. Medication of the elderly should be adjusted the dose according to the needs and tolerability, and over the age of 70 should be halved. Prevent straying into the blood vessels when anaesthetizing, prevent local anesthetic poisoning. We should pay attention to monitoring blood pressure, electrocardiogram, and with rescue equipment when arrhythmia Treatment; drug administration should be immediately discontinued in some circumstances. For example, ECG P-R interval prolongs or QRS wave widens, other arrhythmia or the original arrhythmia deteriorates.